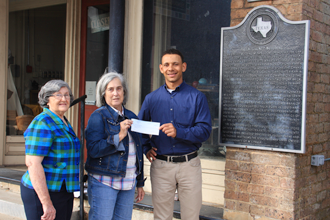 TVEC Energy Management Advisor Chris Walker, right, presents a grant check to Sarah Brown and Betty Hallowell from the Henderson County Historical Society. 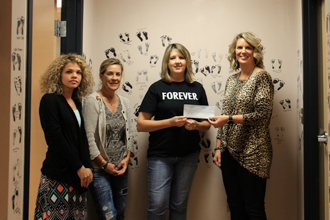 TVEC Public Relations Representative Kari Wilmeth, right, presents a grant check to Living Alternatives representatives Cheryle McCann, Renee Landers and Rachel Chapman. 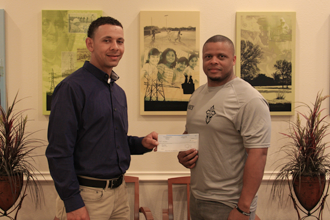 TVEC Energy Management Advisor Chris Walker, left, presents a grant check to Corey Rodriguez from Men Unleashed. 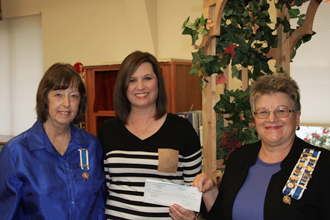 One Mans Treasure web TVEC Public Relations Representative Laura Melton presents a grant check to Annette Jenkins from One Man’s Treasure..
TVEC Public Relations Representative Joy Long, right, presents a grant check to Linda Mynar, left, and Susan Martz-Cothran from the Sarah Maples Chapter. 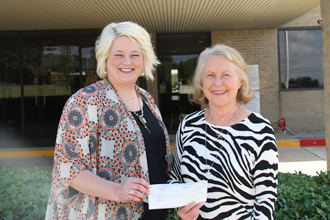 TVEC Public Relations Representative Joy Long, right, presents a grant check to representatives from the Shining Light Food Ministry in Wills Point. 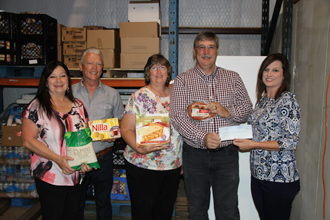 Pictured from left are Brenda Williams, Mike WIlliams, Debbie Burrow, Bobby Burrow and Long.